Nationality: Irish. Born: Limerick, 1 October 1933. Education: Studied at the London Academy of Music and Dramatic Art. Family: Married 1) Elizabeth Rees-Williams, 1957 (divorced 1969), four children, including the director Damian, and the actors Jared and Jamie; 2) Ann Turkel, 1975 (divorced 1982). Career: Mid-1950s—member of Joan Littlewood's Theatre Workshop Company; 1956—West End debut; 1958—film debut in Alive and Kicking ; 1968—signed three-picture contract with Paramount; success as a recording artist; 1990—returned to London stage in Henry IV . Awards: Best Actor Award, Cannes Festival, for This Sporting Life , 1963. Interview, in Films and Filming (London), April 1965. Interview, in Photoplay (London), June 1977. Interview with T. Perlmutter, in Cinema Canada (Montreal), February 1986. Interview with Lynn Barber, in the Independent on Sunday (London), 1 July 1990. Interview with John C. Tibbetts, in Literature/Film Quarterly (Salisbury), January 1993. Interview with Brian Case, in Time Out (London), 19 March 1997. Interview with Evgenij Cymbal, in Iskusstvo Kino (Moscow), February 1998. Smith, Gus, Richard Harris: An Actor by Accident , London, 1990. Callan, Michael Feeney, Richard Harris: A Sporting Life , London, 1992. Collins, G., "Richard Harris: At Work in 'The Field,"' in New York Times , 16 December 1990. Iskusstvo Kino (Moscow), September 1993. Richard Harris's career is linked to a pair of his contemporaries: Peter O'Toole (who, like Harris, is an Irishman), and South Wales-born Richard Burton. All three were outstanding actors who burst onto the international film scene in a flash and were heralded for their ability to command movie screens. And similarly, all three dissipated themselves by carousing and dallying with spirits, in the process dulling their talents and losing their looks. But of the three, Harris's career has never quite equalled that of Burton or O'Toole. After acting on stage during the 1950s as a member of Joan Littlewood's Theatre Workshop Company, Harris appeared in supporting roles in various, mostly British-made features. More often than not he is the macho Irishman, representing the lower ranks against effete officers and higher-billed movie stars in the likes of Shake Hands with the Devil and A Terrible Beauty (in which he serves in the Irish Republican Army), The Guns of Navarone and The Long and the Short and the Tall (in which he grunts through World War II), and The Wreck of the Mary Deare and Mutiny on the Bounty (in which he is a mutinous scoundrel). His key early career performance came in a starring role, as one of the classic angry young men of early 1960s British cinema. In Lindsay Anderson's This Sporting Life , Harris offers a soul-rattling performance as a rugged, discontented Yorkshire coal miner who becomes a fiercely brutal professional rugby player. The actor perfectly conveys his character's masochistic tendencies as he takes his physical and emotional knocks on and off the playing field. As the years passed, however, Harris became known more for his headline-grabbing bouts of public drunkenness than for his work on screen. He had become established as a name actor, and he traded in on his fame to earn paychecks by appearing in a variety of international productions. Several were action and historical dramas, including The Heroes of Telemark , The Bible , and Cromwell ; his performances became ever more hammy, as evidenced by his work in Major Dundee and The Molly McGuires . On rare occasion, he fully succeeded in a role: he had his best part since This Sporting Life in the violent back-to-nature cult hit A Man Called Horse , playing a nineteenth-century English aristocrat who is seized by the Sioux and suffers through torture to demonstrate his worth. But this success did not propel him upward. Rather, he repeated himself in two shabby sequels, The Return of a Man Called Horse and Triumphs of a Man Called Horse , and covered similar terrain in Man in the Wilderness and The Deadly Trackers . Unlike Little Big Man and Dances with Wolves , there is no attempt at liberal political correctness in any of these films; their chief ingredient is suffering, for the sake of suffering. Harris did enjoy several offscreen successes. 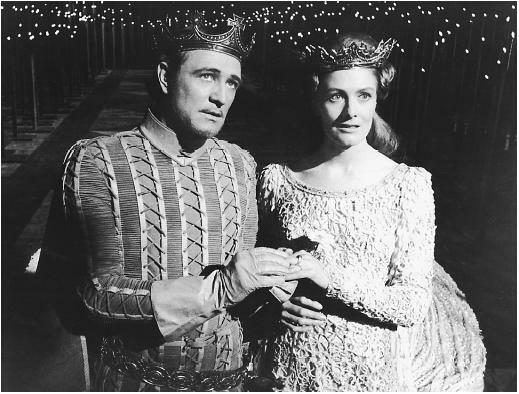 His song "MacArthur's Park" was a freak hit, and he played King Arthur on stage in the musical Camelot (earlier, he had appeared in the role in the illconceived screen version). But Harris mostly bounced around the movies. He co-wrote the screenplay of a dull thriller with a colorful title, The Lady in the Car with Glasses and a Gun . He executive produced and wrote a song for Echoes of a Summer , in which Jodie Foster has a fatal illness. He even turned to direction with Bloomfield , a drama about a battered soccer player which harkens desperately back to This Sporting Life . He appeared in a pair of wry potboilers, 99 and 44/100 Per Cent Dead and Juggernaut (in which he is reduced to self-parody). Ultimately, he was content to accept any old role in any old action picture he was offered, wearily plodding without commitment through the hijacks, escapes, shootouts, and travelogue locations in The Cassandra Crossing , Golden Rendezvous , The Wild Geese , and Highpoint . Perhaps his low points were appearances in a couple of standing-joke movies with Bo Derek, Orca (in which he snaps at Charlotte Rampling, "I resent it when a pretty and intelligent woman tells me I'm dumber than a fish") and Tarzan, the Ape Man (playing Jane's put-upon explorer father). Had his stature been greater, he might have been cast opposite Audrey Hepburn in Robin and Marian ; instead, Sean Connery got the role, with Harris reduced to a cameo as Richard the Lion-Hearted. In the early 1980s, with his career languishing, he semiretired to Paradise Island in the Bahamas, where he rid himself of his drinking and embraced a more simple lifestyle. In the 1990s, well into middle age, Harris enjoyed a celluloid renaissance. This was sparked by his Academy Award-nominated performance in The Field , in which he has his best role in years: "Bull" McCabe, a charismatic Irish tenant farmer who has spent his life toiling his land. Conflict arises when the acreage is made available for auction, and it appears that the highest bidder will be a rich American planning to pave it and make it into an access road. Harris gives a resounding, commanding performance as the self-respecting farmer, a relic of a more uncomplicated era, who perceives that divinity and nature are one in the same. He later made a brief but colorful appearance in Unforgiven as the insolent railroad gunman English Bob. Most recently, he has been paired in star turns with equally powerful actors whose characters outwardly have virtually nothing in common but who come to bond in the course of the story. In Wrestling Ernest Hemingway , he is an Irish ex-sea captain—a character he was born to play—whose need for camaraderie links him with Robert Duvall's Cuban barber. Cry, the Beloved Country , a remake of the 1951 film of Alan Paton's esteemed novel of South Africa, is the story of two fathers, one black and the other white, who know each other only by sight but become united in tragedy. Harris is quietly effective as a conservative South African farmer who becomes embittered upon the murder of his social reformer son, whose killer so happens to be the son of an elderly Zulu priest (James Earl Jones). Despite these recent successes, Harris's career will forever be characterized not by what was, but by what might have been.